Hypersomnia, or hypersomnolence, is a neurological disorder of excessive time spent sleeping or excessive sleepiness. It can have many possible causes and can cause distress and problems with functioning. In the fifth edition of the Diagnostic and Statistical Manual of Mental Disorders, (DSM-5), hypersomnolence, of which there are several subtypes, appears under sleep-wake disorders. Hypersomnia affects approximately 5% of the general population, “with a higher prevalence for men due to the sleep apnea syndromes”. 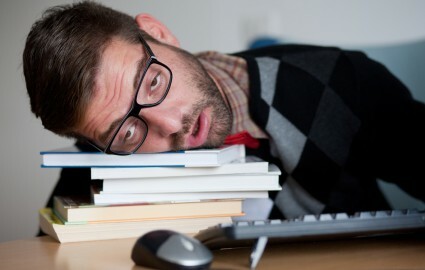 “The severity of daytime sleepiness needs to be quantified by subjective scales (at least the Epworth Sleepiness Scale) and objective tests such as the multiple sleep latency test (MSLT).” The Stanford sleepiness scale (SSS) is another frequently-used subjective measurement of sleepiness. After it is determined that EDS is present, a complete medical examination and full evaluation of potential disorders in the differential diagnosis (which can be tedious, expensive and time-consuming) should be undertaken. There are many neurological disorders that may mimic the primary hypersomnias, narcolepsy and idiopathic hypersomnia: brain tumors; stroke-provoking lesions; and dysfunction in the thalamus, hypothalamus, or brainstem. Also, neurodegenerative conditions such as Alzheimer’s disease, Parkinson’s disease, or multiple system atrophy are frequently associated with primary hypersomnia. However, in these cases, one must still rule out other secondary causes. Chronic fatigue syndrome and fibromyalgia can also be associated with hypersomnia. Regarding chronic fatigue syndrome, it is “characterized by persistent or relapsing fatigue that does not resolve with sleep or rest. Polysomnography shows reduced sleep efficiency and may include alpha intrusion into sleep EEG. It is likely that a number of cases labeled as chronic fatigue syndrome are unrecognized cases of upper airway resistance syndrome” or other sleep disorders, such as narcolepsy, sleep apnea, PLMD, etc. Similarly to chronic fatigue syndrome, fibromyalgia also may be associated with anomalous alpha wave activity (typically associated with arousal states) during NREM sleep. Also, researchers have shown that disrupting stage IV sleep consistently in young, healthy subjects causes a significant increase in muscle tenderness similar to that experienced in “neurasthenic musculoskeletal pain syndrome”. This pain resolved when the subjects were able to resume their normal sleep patterns. Autoimmune diseases, especially lupus and rheumatoid arthritis are often associated with hypersomnia, as well. Morvan’s syndrome is an example of a more rare autoimmune illness that can also lead to hypersomnia. Celiac disease is another autoimmune disease associated with poor sleep quality (which may lead to hypersomnia), “not only at diagnosis but also during treatment with a gluten-free diet.” There are also some case reports of central hypersomnia in celiac disease. And RLS “has been shown to be frequent in celiac disease,” presumably due to its associated iron deficiency. Hypothyroidism and iron deficiency with or without (iron-deficiency anemia) can also cause secondary hypersomnia. Various tests for these disorders are done so they can be treated. Hypersomnia can also develop within months after viral infections such as Whipple’s disease, mononucleosis, HIV, and Guillain–Barré syndrome. Many medications can also lead to secondary hypersomnia. Therefore, a patient’s complete medication list should be carefully reviewed for sleepiness or fatigue as side effects. In these cases, careful withdrawal from the possibly offending medication(s) is needed; then, medication substitution can be undertaken. Mood disorders, like depression, anxiety disorder and bipolar disorder, can also be associated with hypersomnia. The complaint of EDS in these conditions is often associated with poor sleep at night. “In that sense, insomnia and EDS are frequently associated, especially in cases of depression.” Hypersomnia in mood disorders seems to be primarily related to “lack of interest and decreased energy inherent in the depressed condition rather than an increase in sleep or REM sleep propensity”. In all cases with these mood disorders, the MSLT is normal (not too short and no SOREMPs). Although “there has been no cure of chronic hypersomnia”, there are several treatments that may improve patients’ quality of life, depending on the specific cause or causes of hypersomnia that are diagnosed. Reynolds, Charles F.; O’Hara, Ruth (2013). “DSM-5 Sleep-Wake Disorders Classification: Overview for Use in Clinical Practice”. The American Journal of Psychiatry. 170 (10): 1099–1101. Retrieved 12 January 2017. The aim is simply to acknowledge the bidirectional and interactive effects between sleep disorders and coexisting medical and psychiatric illnesses. “Sleep Disorders”. American Psychiatric Association. 2015. Retrieved 12 January 2017. Dauvilliers, Yves; et al. (2006). “Differential Diagnosis in Hypersomnia”. Current Neurology and Neuroscience Reports. 6 (2): 156–162. doi:10.1007/s11910-996-0039-2. PMID 16522270. Neil Freedman, MD. “Quantifying sleepiness”. Retrieved 2013-07-23. Montplaisir (2001). “Idiopathic hypersomnia: a diagnostic dilemma. A commentary of “Idiopathic hypersomnia” (M. Billiard and Y. Dauvilliers)”. Sleep Medicine Reviews. 5: 361–362. doi:10.1053/smrv.2001.0216. PMID 12530999. Sansa, G; Iranzo, Alex; Santamaria, Joan (Jan 2010). “Obstructive sleep apnea in narcolepsy”. Sleep Med. 11 (1): 93–5. doi:10.1016/j.sleep.2009.02.009. PMID 19699146. “MedLink Clinical Summary: Sleep and neuromuscular and spinal cord disorders”. MedLink. Retrieved 7 January 2014. Gotts, Zoe; Deary, V.; Newton, J.; Van Der Dussen, D.; De Roy, P.; Ellis, J. G. (Apr 2013). “Are there sleep-specific phenotypes in patients with chronic fatigue syndrome? A cross-sectional polysomnography analysis”. BMJ Open. 3 (6): e002999. doi:10.1136/bmjopen-2013-002999. PMC 3669720  . PMID 23794547. Lewis, Steven L. (2013). Neurological disorders due to systemic disease. Chichester, West Sussex: Wiley-Blackwell. pp. 261–282. ISBN 978-1-4443-3557-6. Zingone, F.; Siniscalchi, M.; Capone, P.; Tortora, R.; Andreozzi, P.; Capone, E.; Ciacci, C. (2010). “The quality of sleep in patients with coeliac disease”. Alimentary Pharmacology & Therapeutics. 32 (8): 1031–1036. doi:10.1111/j.1365-2036.2010.04432.x. ISSN 0269-2813. “Abstractverwaltung Congrex”. Retrieved Aug 10, 2014. “About Idiopathic Hypersomnia”. Hypersomnia Foundation. 2015. Retrieved 30 January 2017.